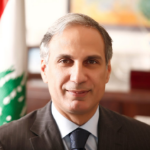 Raed H. Charafeddine is the First Vice-Governor at Central Bank of Lebanon since April 2009. He is also the Alternate Governor for Lebanon at the International Monetary Fund as well at the Arab Monetary Fund’s Board of Governors; Alternate Chairman of the Capital Markets Authority in Lebanon; Chair of the Advisory Council for the Islamic Finance Qualification (IFQ); and Executive Director for the Levant region at the Arab Monetary Fund’s Board of Executive Directors and member of the Audit and Risk Committee (2013 – 2016). He has 20 years of banking experience at leading commercial banks in Lebanon and in the United Arab Emirates. Held senior positions including Deputy General Manager and Director of Total Quality Management (TQM) program. He has a of masters and bachelor's degrees in business administration from the University of North Carolina, Charlotte in the United States.